China economy has always been in to tough policy decisions and decisions which will bring growth for other economies too. In fact china follows the rule of prosperity where I will not grow along but I will grow along the society. In its latest FDI policy China has opened up new gates where flow of investments will come. China has added sectors which include high-end manufacturing like textiles and machinery, emerging industries that bring new technologies to China, as well as green businesses like battery recycling. Services industries such as auto charging stations, intellectual property rights service and career training will also be welcome. The below image depicts the GDP growth and the FDI growth of China from 2001 to 2006.I provided this old data since to make an clear understanding of the World Economic Boom Period. This time their has been a turnaround in the policy framework designed by china. China has included rather removed protection cap from many sectors which were earlier were not allowed for FDI investments. This removing of cap clearly depicts the change in cultural outlook being envisaged by china towards its economic growth. Overseas investment in medical institutions and financial leasing firms has been including in the new FDI policy of China. At the same time china has capped FDI investments in automobile, poly silicon and coal chemical plants due to its over capacity of production. Under the new policy FDI investments has been encouraged in the circular economy, the collection and treatment of waste electronic appliances and electronic products, mechanical and electrical equipment, and batteries. Further the policy states attraction of FDI in energy-saving and environmental protection, new-generation information technology, biology, high-end equipment manufacturing, new energy, new materials, and new energy vehicles. The new FDI Catalog includes key component parts for new energy vehicles and next-generation internet system equipment based on IPv6, Along these lines, nine service industries have been added to the encouraged category in the new Catalog, including motor vehicle charging stations, venture capital enterprises, intellectual property rights services, marine oil pollution clean-up technical services, vocational skills training, Hence the new FDI policy is an compact and well designed to attract investments which will rule the world in coming decades. The guidelines of the new FDI policy will come into effect on January 30, 2012. Further foreign capital in the energy sector involving exploration and development of unconventional sources such as shale gas and deep-sea gas hydrates have been deeply focused under the new guideline of FDI. At the same time foreign investors will possibly be encouraged to form joint ventures or to cooperate with Chinese companies to enter into these sectors. In the side chart we find the historically china FDI utilization efficiency has only grown. This new policy will also have the same affects as in the history it has created on the developed economies. This new policy in turn has led to continued loss of manufacturing industries and jobs, further weakening the vitality of these economies. From the pages of history we find many instances about the number of increasing unemployment across the globe due to China’s FDI policies. The extremely low Chinese labor costs lures multinationals to do investments away from other Asian and Latin American to low-cost export platforms created by China. FDI flows from the US dropped by 23.05 per cent year-on-year to USD 2.74 billion in November. China is holding the No.1 position for nine consecutive years. A rising middle class followed with growing incomes, urban migration & increasing market demand are considered to be the main factors which enables China to attract FDI. Despite of the global economic turmoil, inflows into the Chinese economy came at US$175 billion in 2010, up 1% from last year, which was US$7 billion higher than its foreign investment peak in 2008. FDI in China’s services sector showed the fastest growth from January to May this year, increasing 31.3% compared to the same period in 2010. There is a growing number of studies on the potential Chinese FDI diversion. In a series of papers, Chantasasawat, Fung, Iizaka and Siu (2003, 2004a, 2004b and 2004c), Eichengreen and Tong (2005) and Zhou and Lall (2005) provided econometric evidence concerning the impact of the rise of China on the FDI inflows to East. China has again lead such an policy where other economies across the world will have to become more competitive to attract FDI. In fact India is the first one to whom the challenge has been thrown and it’s up to the famous political heads of India that how they will deal with the challenge. 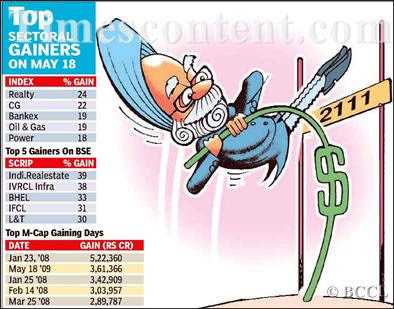 Currently India surged to the second place, passing the United States. India’s previous FDI peak was achieved in 2008, when it attracted US$43 billion, while last year the number dropped to US$25 billion. Hence the challenge for Indian FDI is now the biggest game. And in order to attract the FDI in India we need policies like Companies Bill, Land Acquisition Bill and DTC are the few which will help India to attract FDI. Special focus needs to be provided to SEZ which is currently reeling under pressure.SEZ is the one of the prime weapons which will help India to attract FDI. Well China is poised for another round of growth where as developed economies will find some space for growth but the transfer of human capital is biggest requirement of the time. Gold will be back in action with a bang in 2012.Now many of my fellow friends will acclaim that I am opening up an old wine bottle. But the demand will come from many new emerging nations excluding the BRIC nations. China’s gold imports has spooked to 50 percent in October from September. The most shocking growth number is about the import made by china which soared to 4,000% from October of a year ago, to an all-time single-month record high of 85.7 tons. Now my friends will again claim me as lunatic to express that type of growth numbers. Its the real true number. China is all set to rule the Gold market of the world. China will very soon soon-to-dominate the New York-London gold cartel. Currently, the majority of China gold reserves have been located in the United States and European countries. And this has lead Europe and US to suppress the real price of gold. Infact suppressed the price of gold from rising. Reason behind such an activity is want to see other countries turning to gold reserves instead of the U.S. dollar or Euro. Suppressing the price of gold is very beneficial for the U.S. in order to maintain the U.S. dollar’s to rule the world as an international reserve currency. So does this mean china is slowly planning to replace dollar with renminbi. Well china have been planning and working on this from a long term and it can be taken for believe that one fine morning they will do it just like they hold 60% of the U.S treasuries. Chinese imports of gold is about to hit 470-490 tonnes for the full year, up from last year’s 245 tonnes a near-double spike in volume anticipated at the close of 2011.China has spooked massive advertisements of its gold purchase and asking its citizens to convert their savings into gold from paper currency. 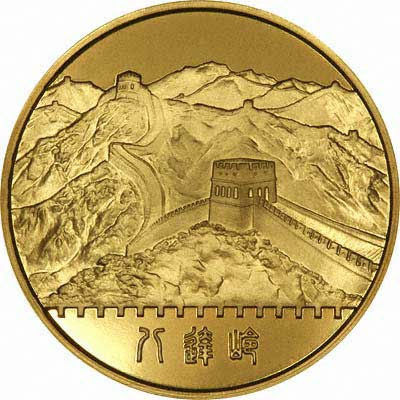 As a result 1 billion Chinese consider buying gold as a hedge against inflation and to preserve values in a world where currencies can fall. Gold Sell & Purchase might Begin. Italy is having the worlds 4th largest reserves of gold at 2,452 tonnes. This is even more than France, and more than twice as much as China. Hence if Italy’s gold has a value of $123 billion enough to cover this year’s $80 billion budget shortfall. Portugal’s $19 billion in bullion is more to cover its $13 billion deficit. France has $122 billion worth of bullion, enough to make a massive dent in its $150 billion deficit. China might be the biggest buyer as it will try its all means to convert and shifts its $3 trillion dollar reserves into gold. At the moment, the richest Western countries, including the United States, Germany, Italy, and the Netherlands, hold between 60% and 80% of their entire reserves in gold. Where the reserve of Gold being held by China is 2%.Now this is not an misprint. Hence china has an fierce mind of competition which will exploit it to buy gold and increase its reserves. In fact the world is going to witness another repeat of the history. When gold changes hands economic power also shifts. Like the one that happened century ago when plenty of that French, German and British gold ended up in the hands of the United States. We will be the part of the next biggest history which will be crated in this century. On the hand the world is set to dig more gold out of the earth. Now if we look into other emerging nations like Tanzania the land of South Africa. The government has requested mining firms in Tanzania to help in the creation of a gold reserve in the country. Now I am not an Financial Astrologer who will predict the Gold price. As an economist I can say only price will be worth by the purchaser hence all eyes on the Buyer. Quick money and quick return has increased the demand of Private Equity and Venture Capitalist to flood opens the gates of investments. Every one is scouting to find quick gains from investments. Investments in those projects where the government regulations will be low followed with less tax and more income generating avenues. Projects are designed accordingly where mouthwatering returns are being planned to attract the bees called Private Equity and Venture capitalist. We all the know the mechanism of how the Private Equity in Indian economy works out. One of the prominent ways of exit is either through Pre IPO exit or through IPO exit. If we look historically we will get the proof of the demand of private equity and vc funds that had grown through the number of IPOs those came within the past decade. I will give a simple data of the number of IPOs came from 2001 to 2011.In the this below data you will find that from the period of 2004 to 2007 was the period where the Indian primary market was flooded with IPO. Now this is an separate ball game that majority of the IPO have astronomically returns in the initially days and later on hanged up. One of the prominent reasons is the exit of VC, PE and institutional investors. These institutional investors are the native of any other planet. They are the modified version of investors who reap benefits at the cost of retail investors. But after ruling for an decade its now being witnessed that the market are flooded with VC and PE and now the numbers have grown up so much that we will find them sitting at every corner of the road. I find that there is going to be a huge turn around in their society in the form of mergers and shut down of ventures. In other words consolidation for the industry is about to begin. I find my community that is Cost Accountants have also come up with similar business model providing funding arrangements for projects. Reason quick money can be earned from being an intermediary between the project and the investor. But after ruling for a decade and when we all know that Indian economy is now being acclaimed as an emerging economy why we are going to witness consolidation. Prime reasons is quick money formula is now available in the news papers which in the previous ten years remained a secret code. Indian economic situation, policy lags, delay is process of execution due to red tape policies and multiple and high level of greed has opened d the gate of consolidation. Current situation of the industry has resulted dead in IPO exit which is the most important return generating form. VC, PE are not finding the desired return and will falter in delivering back the owners of the original fund with the desired return. In the year of 2006 I find many PE finding easy ways to raise funds now it has become a tough job. Within the next 12-18 months, many PE firms, mostly the newer ones will be scouting to exit from raising funds. In September 2006, PE firm Everstone Capital raised its first $425 million fund in barely 90 days. But it spent a year closing its second $550 million fund in March this year. They find the difficulty not in the slow process of Indian red tape movements alone. Returns a form value based project has also declined backed by stiff competition after 2008 debacle.PE and VC are scouting for lucrative sectors where govt. regulations are less and wealth can be maximized. Most importantly the exit route of PE and VC needs to be changed. With the decline in Indian stock market performance IPO will find its place very hard to find a proper valuation. Buying quality assets have become an fierce game. But if we look globally we are finding more overseas portfolio of VC and PE are looking forward to Indian markets making the deal tough for domestic PE and VC. At home consolidation is about to begin. After independence we will have to stand on our own and rely on our own resources, the unifying force, the cement…which had hitherto been supplied by the United Kingdom Government will be removed, and will have to be replaced by new virtues of our own which must be capable of keeping all the diverse elements of the country together, in mutual trust and harmony and with a common national purpose." Excerpt taken from Awo, the Autobiography of Chief Obafemi Awolowo of Nigeria. After the Second World War people in Africa wanted change. Only Egypt, Liberia and Ethiopia were independent at that point. But it was Indian self-rule which triggered the momentum leading to independence. Everywhere the mood was hopeful as people were inspired by the vision of a new society free of European control. The year 1960 saw independence sweep across much of Africa. Fourteen countries ceased to be French colonies, while the Belgian Congo became Zaire and Somalia and Nigeria broke from British control. After 50 years of Independence African economy is being declared the economy of growth the birth of 3rd generation of Emerging economies. In the last couple of years African has been on the map of every business house across the world. The country of Black where torture and pains were the emblems for the citizens has some thing interesting to fell about. In an a recent research finding it was found that Africa grew faster than East Asia, including Japan. Even IMF expects Africa to grow by 6% this year and nearly 6% in 2012, about the same as Asia. Nothing has changed except the perception of the world looking towards the growth and scare resources which Africa possesses. We all know that Africa is famous for Diamond a mine which is mostly smuggled to Europe and other parts of the world. Africa has felt the air of development and Technology. Technology is fast rooming and bridging the hurdles of poor infrastructure of Africa(which is yet to pick up. According to my research I find that Africa is still struggling with meeting its food supply demand in accordance to its population growth. The three factors that will contribute in Africa to future increase in food supply are expansion of land under cultivation, irrigation intensive projects, and biotechnological increase in yield. Technology will play the pivotal role in upgrading the agriculture segment. But technology alone will not be sufficient to increase the output of African foods items. . The size of land currently under cultivation in Africa for all agricultural crops is about 76.1 million hectares. The agriculture sector accounts for 35 percent of the continents GDP and corresponds to 40 percent of its exports. About 72 percent of the people live in the rural areas and the sector supplies 70 percent of the employment opportunities We find vast amount of land which is not suitable for agriculture in Africa. The first responsibility of technology will be to transform the barren land into productive and to stop Desertification. It has been found that Potential land for crop production under rain-fed but not in agricultural use, is more than twice the current harvested land. Hence use of hybrid seeds, modern irrigation facility are all in the dream run until the soil becomes fertile to produce. Hence Africa is being found as an immense potential country for development of agriculture giving a way out to the struggling developed economies to survive the de-growth phase. Irrigations stand to be another hurdle for African economy. Africa needs recycle use of water since the cost associated with developing irrigation infrastructure in Africa will increase the cost of production of agricultural output. Biotechnological food supply increase would not be sustainable in African countries without building systematic multidisciplinary strong institutions. Africa needs proper food storage facilities along with strong R&D built in-house to support the African agricultural growth. Moreover proper system needs to be developed for bridging the gap between the farmer and the end user of agri products. Reduction in the gap will enable improvement of farmer’s quality of living. We must not forget that only growth of companies from exploiting the growth of Africa will lead to development. Africa’s development lies within the citizens of Africa. This simple principal is often ignored and ruled out. My research finding depicts that Africa will surpass Asian economies in the next decade in terms of agricultural growth. Reasons are simple lack of opportunities of growth in Developed nations and Emerging nations will lead all their resources to find growth in Africa. Cumulative technology transfer will improve the growth speed faster than these countries individual R&D. A simple example to prove my saying is that it has more than 600m mobile-phone users—more than America or Europe. Since roads are generally dreadful, advances in communications, with mobile banking and telephonic agro-info, have been a huge boon. Africa did not spend any amount on R&D in technology but cumulative transfer of technology has lead faster growth of Africa. In the same way I find through my research that Africa will be the next emerging nation propelling faster than Asia. Vocational and other agricultural technical education will further instigate and bring more stable growth in the macro levels of African development. Africa needs to take out of communal ownership and title handed over to individual farmers so that they can get credit and expand. Developed nations are opening up the trade gates with Africa. America’s African Growth and Opportunity Act, which lowered tariff barriers for many goods, is a good start, but it needs to be widened and copied by other nations. FDI will find its way to Africa and according to my finding I find 25% of Europe, US, China and India respectively are finding growth avenues and to built their foreign exchange and to diversify the change the too in Africa. US unemployment came down to 8.6%.This news will bring smile on everyone’s face particularly on the face of speculators of the sock market. A question might come in your mind why I did not take the name of American people who have got job since I don’t trust the data. US political elections are going to be held in less that a year time and hence we will find many surprise numbers supporting to boost the economy and start of borrow and spend. America's employment report is based upon two type of survey reports: one of employer payrolls, which yielded the 120,000 gain; and a separate one of households, according to which employment rose 278,000. It's the latter survey that's used to determine the unemployment rate. Unemployment drooped as more people are giving up looking for work, there’s the potential for rapid shrinkage in the pool of available employees. The number of people looking for a job fell by 315,000 and the number of people counted as not in the labor force (a different measure) swelled by 487,000 to a record 86.5 million. 120,000 jobs creation is not enough to uplift the growing unemployment in US. US are having an average of about 114,000 jobs a month for the last 6 months. Hence the recent data should be analyzed in a different way to find out the real growth of the US economy. After remaining obsolete for more than 3 years since 2008 most of the work forces of US have lost their skills of jobs. 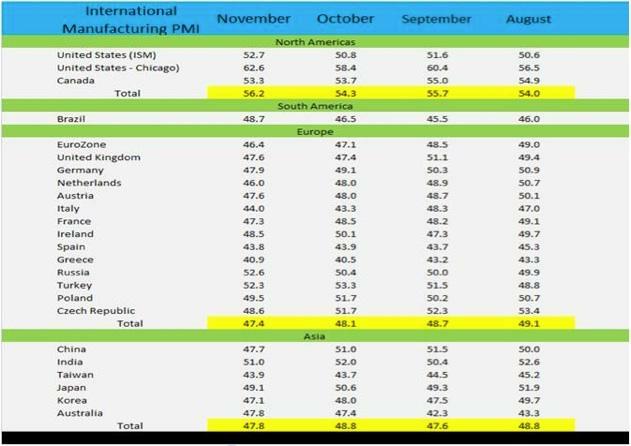 From the below figures of the chart we can find about the movement in PMI (manufacturing production) which is just plummeting as months progress. Of the emerging world, only India and South Africa are growing and it seems that these tow countries are also going to loose the steam. Hence drop in numbers is not to be taken in a big way. Consumer surplus and increase in manufacturing will be key data to be watched in 1st quarter of 2012 not for the 4th quarter of 2011.Since we all should discount the all the economic numbers of 2011 4th quarter since festive season will spook employment and consumption and manufacturing will also grow. But once the season of festive is over growth will slowdown. What we need to understand is that growth of economy of US should not be seasonal affair. We speculators are turning the economic data’s for a seasonal upside in the market. We economists need to look beyond the seasonal affairs. Further unemployment decrease is not the prime factor to be watched. Wage reduction has increased with the unemployment as demand for jobs are higher. The government reports that real average hourly earnings fell 1.6% from October 2010 to this October. Hence 8.6% unemployment from 9% should not be taken as a big improvement of US economy. For many years India’s lack of infrastructure has been identified as one of the major constraints on sustaining a high growth rate. India is reeling under the low GDP growth due to improper infrastructure. For example if one Glass Factory plans to supply glasses by container traveling via road to a buyer who is located in an village then the buyer will get broken glasses at his end. Since the roads connecting the inner part of rural areas are still underdeveloped. Road infrastructure is so poor that we find medical facility in rural areas are improper and inadequate. Since emergency supply remains unreachable due to lack of proper roads. Lack of infrastructure has also resulted many operation s to be localized in some particular states. This is partiality was gained since from time to time majority of Parliament members representing from those particular states. This has resulted too much dependency on particular state resulting imbalances from financial development to society development and finally ending up with ecological development. But what takes to develop the infrastructure of India. Does its requires new generation of young bloods for reforms or policies for development. It needs land and capital the two prime wheels of any economic development. We all know that the 117-year-old Land Acquisition Bill, 1894 is still ruling India despite of its independence achieved over 65 years. Until the bill gets changed Indian roads and its infrastructure will not grow. But, what about capital? Do India have enough funds to finance its infra development. This has also widened the gap of funding for infrastructure projects. The government can take and design many policies to stimulate capital flows into infrastructure like allowing banks to raise resources through long term bonds exempt from statutory requirements and easing norms for insurance companies and pension funds to investment in infra projects. Allowing debt funds to buy loans from the banks for projects that have completed construction and entered into commercial operation. To protect investors from default, the funds would be backed by a government guarantee. Apart from this financiers also need to structure their business models to build high return business. NBFC should be allowed to partner up with banks for develop various financial models which will lead to provide financing infrastructure projects in India. Global banks with strong and healthy condition can develop a synergy with Indian banks to provide financing by developing new models for investment. To date debt financing for infrastructure projects has largely been confined to commercial banks. 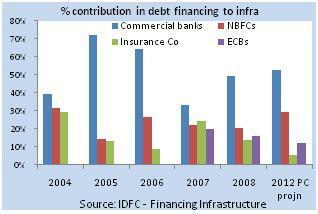 But with the increase in demand of infrastructure projects and opening upon the gates of investments banks became costly source of funding of the projects we need to come up with new models of financing.The below graph is related to ECBs/FCCBs/NBFC and other forms of capital contribution to infrastructure. This will invite many other investors to invest. Foreign investors can diversify their risk by holding a portfolio of projects. The recent participation of FII’s investment in bond market, Credit Default Swaps & derivatives has been very impressive. The side graph depicts the growth and participation of FII investment in securities. Where as domestic insurers and pension funds which have stayed away from infrastructure can take advantage of projects’ steady cash flows without being exposed to construction risk or default risk. Life insurance companies, which have access to long term money and should invest in this pace, are quite passive on it as they are averse to taking on project risk. At the same time this will allow the banks to free up their balance-sheets to lend to new projects. Directly the government can allow banks to provide refinance support to lending by commercial banks by increasing the credit enhancement for infrastructure instruments or through direct investment in hybrid or equity issue by infrastructure companies through an Asset Management Company. Utilization of the foreign reserve is an excellent way to finance the infrastructure growth of India. Take-out financing model this entails a bank transferring its long-term loans for infrastructure projects to term lending institutions after funding projects in the initial years. The government has also approved a take out financing scheme by the India infrastructure Finance Company (IIFCL) to encourage banks to lend more to the sector. The scheme aims to address the asset-liability mismatches faced by banks in financing long-term projects and because some banks were close to hitting the limit of group and single-entity exposure. 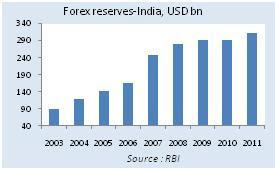 The below graphs represents India foreign exchange reserves. Lending institution should play a pivotal role development infrastructure project financing by offering advisory services. They should play a proactive role in terms of providing strategic analysis, evaluation and financial modeling of projects, tax planning making the project commercially viable.